It's that time of the year when suddenly our calendars are sprinkled with summer weddings. Whether you're going to an elegant city wedding or an outdoor rustic setting, a fancy frock is essential. The summer months give us the opportunity to wear a dress that encapsulates the warm, romantic season. Think off-the-shoulder silhouettes, pretty pastels, charming floral prints, or bright and bold hues that look exquisite when paired with metallic and sparkly accessories. And this season's occasion dresses do not disappoint. Scroll below for our absolute favorites on the market right now that are guaranteed to garner you the title of best dressed guest. From Self-Portrait's new capsule collection, this cobalt blue tiered dress with delicate lace and floral prints is absolutely stunning. We love the sweet green hue and standout halter silhouette. A love letter to warm-weather dressing. Wow the crowds in this utterly charming floral frock. A silky flowing fabric adds a luxe touch. Crafted from the finest baby blue lace, the delicate details are exquisite. Opt for a gorgeous long-length dusty-rose dress in a satin finish. The ruffle details add a romantic touch. Classic polka dots get a chic upgrade. The perfect semiformal outdoor wedding guest dress. Turn heads in a sleek and sophisticated pastel blue hue. The flutter sleeves and swaying skirt capture summer's romantic and lighthearted mood. For more elegant evening affairs, opt for a shimmering metallic fabric. Just add silver accessories to this bright and bold hue. Ideal for a sunny season filled with "I dos". 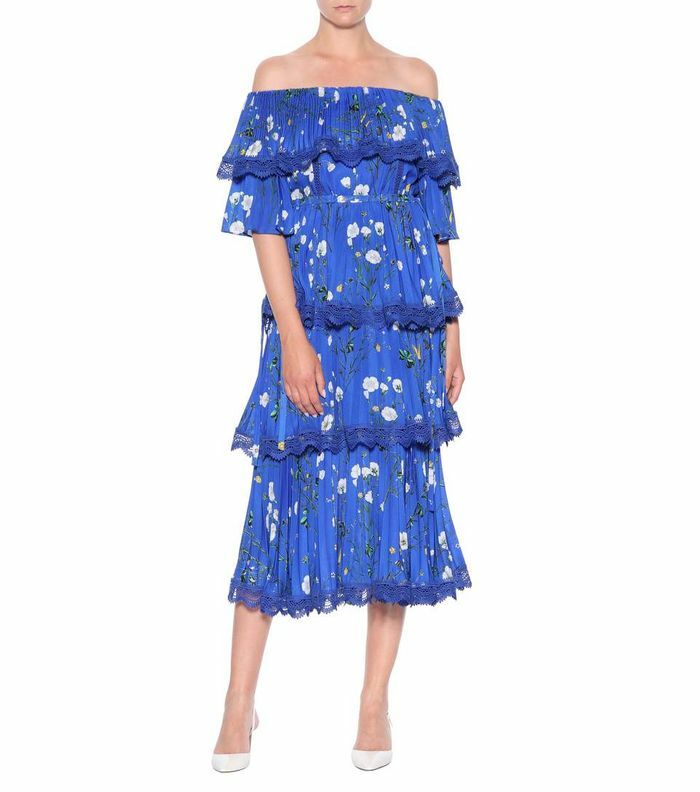 Get this pretty ruffle frock while it's still on sale. Blush pink sequins add a dose of evening glamor. Dance the night away in an elevated embellished slip dress. Make an entrance in a striking silhouette. Up next: If you're attending a wedding, try these chic and comfortable shoes.